Problem: You aren't telling your website visitors what to do next. Every page needs a Call-To-Action. A call-to-action (CTA) is a button or link that prompts your website visitors to take action. It is, quite literally, a "call" to take an "action." Just because you know the action you want visitors to take doesn’t mean they do. Spell it out. A website needs to lead visitors in a direction—a direction you want them to take. Tell them where to go next. Don’t leave them aimlessly wondering around your website. Similar to how a road uses road signs. Decide on ONE action you want readers to take on each page of your site. Every page should have a call-to-action. 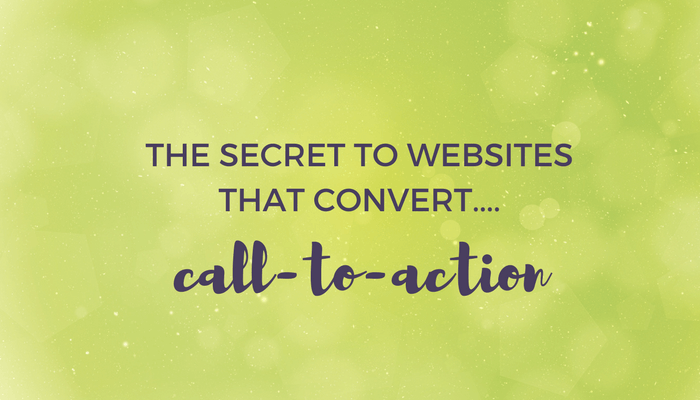 That call-to-action needs to be the main thing you want your visitor to do on that page. Use crystal clear wording so there’s no confusion over what visitors should do. Using a call-to-action will point them to the next logical step to create a nice “flow” through your site. Yes, you can have multiple call-to-actions, but make sure the most important ones are the biggest and stand out. Top right-hand corner of your website: This is the most valuable piece of real estate you have. Footer of your website: Your footer is on every single page and users scroll to the bottom to find links that may not be in your main menu. Within your copy: I recommend placing your call-to-action within the copy of your website on every single page to ensure it’s not missed or forgotten about. Putting your call-to-action in these three places will ensure you get more client leads filling up your inbox. Overall, if you make these three changes to your website you should see an increase in leads and a decrease in your bounce rate. The wording is critical. Use simple wording that clearly specifies the action, usually starting with a verb, and make it clear just what clicking a link or button will lead to. Question: What is the #1 action you want website visitors to take on your Home Page? Is it clearly indicated with a CTA?